Three U.S. military trainers were fatally shot Friday in an exchange of fire at an air base in Jordan, according to U.S. defense officials. Earlier reports that one or two service members were killed were inaccurate, the Military Times reported, citing a defense official. A Jordanian officer was also wounded in the incident. Initial reports said the shooting started when a vehicle carrying the trainers failed to stop at the security gates of the Prince Faisal air base in the city of al-Jafr in southern Jordan. Details are still unclear, however, including as to who fired first, although some reports have suggested Jordan security forces did so. "There was an exchange of fire at the entrance to the base after an attempt by the trainers' vehicle to enter the gate without heeding orders of the guards to stop," a military source told Reuters. "An investigation is now under way to know exactly what happened." A U.S. official later told the outlet only that "the service members were in vehicles approaching the gate of a Jordanian military training facility, where they came under small arms fire," possibly indicating there was no issue with the vehicles not listening to orders to stop. "We are working with the Jordanian government to gather additional details about what happened," the official added. The U.S. embassy in Jordan confirmed the incident. "We have reports of a security incident involving American personnel and we are in contact with Jordanian officials who are giving us all the support," the embassy said in a statement. This is the fourth attack since last November on security services in Jordan, the Wall Street Journal noted. 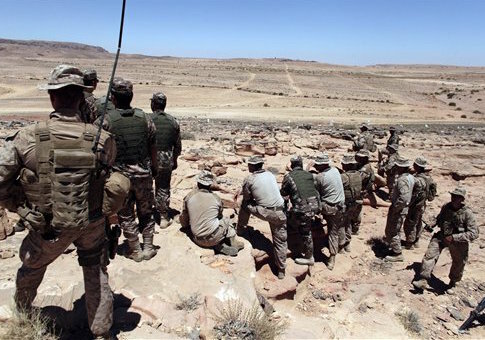 The U.S. military has hundreds of trainers in Jordan, a close American security partner, to help bolster the country's defenses against threats stemming from the Syrian civil war and terrorists in the region. This post will be updated as more information becomes available. This entry was posted in National Security and tagged Jordan, Military. Bookmark the permalink.